The 2013 Full-Time MBA Ranking published by the Financial Times will no doubt grab headlines for the return of the Harvard Business School to the #1 spot for the first time in 8 years. Arguably the most influential business school in the world, Harvard ranked #1 for the first two years of the FT MBA ranking back in 1999 and 2000, and then shared the top position with The Wharton School in 2005. It has featured in the top 5 every year since the FT ranking began, and this year pushes Stanford GSB down to the #2 position. So who are the other winners and losers in the 2013 FT MBA ranking? It looks like another year when US business schools are on the rise, accounting for 6 places among the top 10, and 51 business schools among the 100 that feature in the ranking. Among the top 25, Chicago Booth, UC Berkeley Haas, Northwestern Kellogg and the Tuck School of Business all moved up the table by 2 or 3 places, but the biggest winners this year are the Yale School of Management, which climbed 6 places to #14, and UCLA Anderson which rose 9 places to #23. Further down the list, where the tightly clustered results of the ranking often lead to bigger swings from one year to the next, the University of Illinois Urbana and UNC Kenan-Flagler achieved double digit improvements to move them into the top 50, while UC Irvine jumped 27 places to #54 and Babson College moved from the bottom of the top 100 to #80. Of the 10 business schools that did not make the FT’s top 100 last year, Tulane University made the highest new entry in 2013, ranking #81. Among the biggest losers however was the University of Minnesota, which in 2012 ranked #72, and fell out of this year’s table. Seven other US business schools suffered the same fate, while Penn State, Boston College and USC Marshall suffered drops of more than 20 places, with career progress and alumni salaries influencing their downward moves. European business schools had a mixed year, particularly those from the UK. While the London Business School ranked in the top 5 for the 10th time, other UK business schools mostly struggled, with 5 schools falling out of the top 100, and several others such as Oxford’s Saïd School of Business losing ground. The big success story however belonged to rival Cambridge Judge, whose strong graduate salaries helped the school to climb 10 places to #16. The University of Bath’s School of Management was also one of the highest new entrants, placing at #72. Among the Spanish business schools, IESE consolidated its top 10 position with a rise of two places to #7, while nearby Esade jumped 11 places to #22. But Swiss school IMD continued the slide witnessed in The Economist and BusinessWeek last year, with a 6 place drop to #19. Further down the table, the most unexpected result came from Portugal’s Lisbon MBA. Previously unranked, the school entered the FT ranking at #61, ahead of TiasNimbas of the Netherlands and Germany’s Mannheim Business School, which also entered the ranking for the first time at #64 and #69 respectively. Ireland’s UC Dublin also posted a strong result, jumping 22 places to #64. Though Spain, Portugal and Ireland are among the countries most closely associated with the Euro Crisis, the performance of their schools suggests that they remain good destinations to learn about business. After several years of growing influence, a number of Asian business schools came unstuck in the FT’s 2013 ranking. This was particularly true for institutions from India. The IIM Ahmedabad slumped 15 places to #26, while the Indian School of Business experienced a similar fall, losing 14 places to #34. The Asian winner was Shanghai-based CEIBS, which rose 9 places to make the the top 15. And with HKUST firmly among the world’s top full-time MBAs at #8, the University of Hong Kong climbing 6 places to #31, and Fudan University entering the ranking at #89, China had a good year, with only Peking University Guanghua moving downwards. 2013 also saw the continued rise of South Korea’s Sungkyunkwan University GSB which climbed 15 places to #51, and the entry of Korea University Business School at #86. Elsewhere, the business schools of Singapore and Australia struggled. The National University Singapore fell 13 places to #36, while the Australian School of Business dropped 7 spots to #48 and Melbourne Business School crashed out of the top 50 with a 16 place fall to #62. And finally the business schools from BRICS countries beyond India and China failed match the level of influence of their fast growing economies. Brazil’s Coppead slipped down from #51 to #66, while the University of Cape Town saw a fall of 20 places to #74. The FT is yet to include a Russian business school in its full-time MBA ranking. So as with every year, the delight of students, alumni and staff whose schools have risen in the FT this year will be matched by the disappointment of others whose schools have fallen. 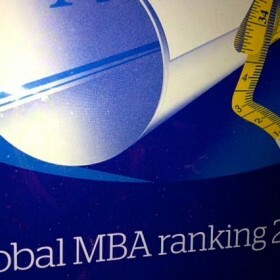 An MBA50.com survey shows that the FT is considered to be the most influential of the various media MBA rankings, with almost one-third of the votes. Though the FT provide some fascinating data beyond the overall results, whether about diversity, international credentials, value for money or careers, neither this nor any other media ranking can really tell you if a particular MBA is the right fit. Only you can work out the best business school in the world… for you.